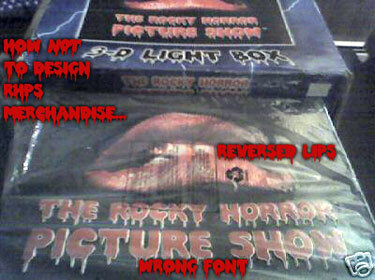 I've created a special font with embedded RHPS and Shock Treatment logos, for licensed use only by specific entities. A copy of this font is available to such entities upon request. If you would like a copy, send us an e-mail to see if you qualify. Alternately, and with considerably less accurate results, you can use the "Double Feature" font, available for free on this site. ...If the design was correct, I would have bought this item in a heartbeat. Instead, I was embarassed that my crappy font ended up on the thing. When using the words logo, it's best to space the lines so that the "drips" overlap into the text below. Use your own discretion. When re-creating The Rocky Horror Picture Show words logo, it is customary to include the word "The" in the logo. Some merchandise has left out the word, and it looks just plain odd. In contrast, when abbreviating, RHPS is the most commonly used phrase (as opposed to TRHPS).